Once you’ve setup Twitter you may want to go back to the “Mail, Contacts & Calendars” preference panel to configure other social accounts and social features like Vimeo and Flickr, and also add your Gmail, Yahoo, and Outlook mail accounts if you haven’t done so yet. Deeper Twitter integration is already in iOS as well, so getting accustomed to using the service is a good idea if you haven’t been active with it before. Even if you don’t share much yourself, it can still be a great source of following news and information, though you’ll ultimately want to download a Twitter app to use it for that purpose. 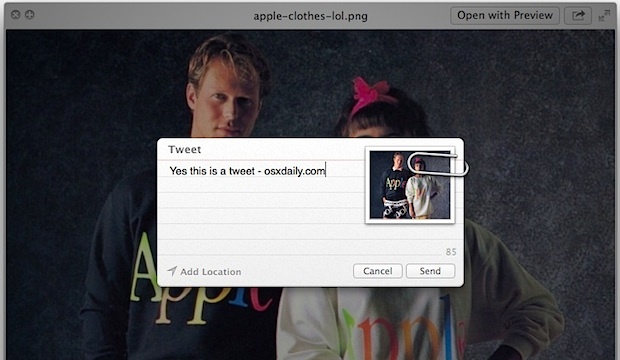 Oh, and don’t forget to follow @osxdaily there too! The annoying thing about integrated Twitter is that when you get an @ reply or DM in the Notifications panel, and proceed to click on it, it will launch the Twitter website in a browser, not the Twitter app. Considering the Twitter app is official, and available through the Mac App Store, there should at least be an option for calling up that conversation. In fact, I got here while looking for a way to answer my friends from this so called integrated system…. The OSX twitter app doesn’t register a URL scheme such as twitter:// so there is no direct input the OS can use to launch a specific part of the app. It’s not Apple’s fault that Twitter is a douchebag when it comes to managing their purchased–I mean–official software. I was wrong. Twitter does expose a URL Scheme. Apple is the larger douchebag in this case. Facebook integration will come this year with an update. Mountain Lion upgrade is supposed to have that integration. The features page on Apple’s website has an asterisk (*) with all Facebook integration and some other features, and the footnote says, these features will be available this fall. I still have a t-shirt with that design, in great condition. Kids and Mac newcomers, I tell you!